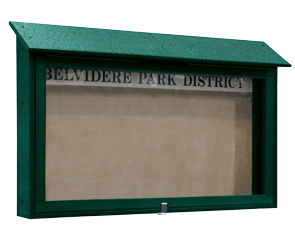 This singled sided recycled plastic message center features a top-swinging polycarbonate door, lockable stainless steel hasp, and a homasote board for posting. Environmentally friendly message centers stop waste from going to landfills and reduce our dependence on fossil fuels. Constructed with Max-R™ recycled plastic lumber, the purest grade of Type-2 HDPE recycled plastic in the industry. Lock not included. Resistant to insects, mildew, mold, cracking, and graffiti, this message center will never need paint. Available in various rich, fade resistant colors.